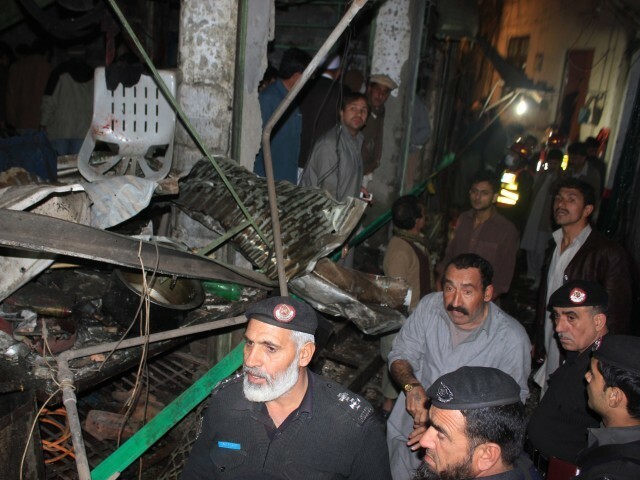 JNN 05 Feb 2014 Peshawar : Nine people were Martytred and more than 42 others injured when a powerful explosion carried out by a suicide bomber ripped through a local hotel frequented mostly by Shias in the Qissa Khwani Bazaar area of the provincial capital on Tuesday. The incident took place at Pak Hotel near Imambargah Alamdar in Kucha Risaldar, a Shia dominated neighbourhood of Peshawar. Police officer Rizwan Khan said that the hotel is frequented mostly by Shias who visit Imambargah Alamdar next door. Most of the dead and wounded were Shias, he added. Most of the dead and injured hailed from Hangu, Parachinar or Kurram agency. The blast came as talks between government negotiators and representatives from the Pakistani Taliban designed to end years of fighting in the northwest were delayed. Confirming the death toll, Superintendent Police (SP) City Muhammad Faisal Mukhtar said it was a suicide attack. Provincial Health Minister Shaukat Yousufzai told reporters that eight people were killed and 42 others injured in the suicide bombing. “Six of the dead have been identified,” he said. Injured in reportedly critical condition were taken to Lady Reading Hospital where an emergency had been imposed. Jamil Shah, media coordinator at LRH earlier said that six dead bodies and 32 injured have been brought in the hospital. Women and children were among the injured, he said. Shafqat Malik, an officer of Bomb Disposal Squad (BDS) said that about six kilos of explosives were used in the blast. He said hands and legs of the suicide bomber have been recovered from the site which were sent for laboratory and DNA tests. He said other forensic evidences have also been collected. Musharraf Hussain from Parachinar, who was on the spot as well, said the blast destroyed three shops and the eatery kiosks in front of the Pak Hotel and Imambargah Alamdar inside Qissakhwani Bazaar. We shifted the injured and dead to the hospital on our own as no rescue worker reached the spot soon after the blast. Injured in reportedly critical condition were taken to Lady Reading Hospital where an emergency was imposed. Jamil Shah, media coordinator at LRH confirmed that nine dead bodies and 50 injured have been brought in the hospital. Women and children were among the injured, he said. Earlier in the Day , a prominent Shia leader was shot dead in the Same Qissa Khwani area, sparking a protest outside a hospital where his body was taken. The killing comes just weeks after a Shia scholar was gunned down in the same city. “Haji Sardar Ali was shot dead in the morning in Qissa Khwani bazaar,” senior police official Faisal Mukhtar said. Ali headed the local branch of the Tehreek Nafaz-e-Fiqah-e-Jafaria. Zaheerul Islam, the deputy commissioner of Peshawar, confirmed the incident. “Haji Sardar Ali owned a general store in (the) bazaar. He was going to his shop when unknown gunmen shot him dead,” he said. Ali was rushed to the city’s Lady Reading Hospital but was pronounced dead on arrival, Mukhtar said. Around a hundred Shias gathered outside the hospital and chanted slogans demanding the arrest of the attackers. Tehrik e Taliban Pakistani has denied to take the responsibility of the above Mentioned attack , while it is quite obvious from the Nature of attack , and the target that it can only be Done by the Devilish Taliban , as they are the Only ones , to Mislead and train the Suicide Bombers . While they have denied to take the responsibility of the attack as Whole of the Pakistani Nation is cursing them of their Terrorist Activities and Pressurizing the Political Government And the Military Establishment to Provide the Required Security to the Nation , as they are the Defender of the Country , and it is their Duty to Punish and get rid of the enemies of Pakistan. Scholar Allama Alim Al-Musvi was shot while walking to the mosque in the same bazaar on January 20. This entry was posted in Asia Pacific, Pakistan News and tagged Imambargah Alamdar, Lady Reading Hospital, Muhammad Faisal Mukhtar, Peshawar, Qisa Khwani Bazar, shia, Suicide attack. Bookmark the permalink. Whilst the arrangement for so called peace talks are being made and all and sundry are pleading with US (as if they will take any notice), the terrorists are having a field day killing innocent men women and children and than denying any responsibilty, inspite of their footprints all over the scene of crime.Now what has that loony imran got to say ?put a microphone infront of him and he will sing and dance in defence of his brothers the talibans-such is the intelligent level of the head of PTI and his supporters.Stop the drones and we carry on killing!Those elected who are responsible for the protection, law and order should, if they had any sense and feeling of shame ,should resign,. but they have none and will never have any,They are as guilty as the cursed terrorists.